The Flite Test A-10 Warthog is one of the largest and most complete Flite Test kits available. This kit includes all of the lasers cut components, including the firewalls, hardware, pushrods, duct formers, landing gear, and wheels. With a wingspan of over 60 inches, this plane really carries itself well through the sky! Although this aircraft is big, it is not a complicated build. It is cut out of eleven sheets of foam that fold and bend to creating an extremely rewarding build process. Producing this kit is a labor of love with almost an hour and a half of laser cutting time. This aircraft has great flight characteristics in the wind and calm weather alike. When you put a 4 cell battery on this aircraft it is fully aerobatic and you get the perfect pairing of speed and efficiency. The flight characteristics of this A-10 are like none other on the market at this size. It performs like a real A-10 with vertical lines and incredible performance at both high and low speeds, and with the included landing gear set, you can easily land and take off of short grass. The FT Warthog is a direct result of the Giant A-10 vs Tank episode! With such an incredible response to that project and particularly the aircraft build, Flite Test wanted to make it accessible while still maintaining a substantial size and presence in the air. Although this is a smaller version of the giant A-10 featured in the video, it is definitely an advanced build, but once it is completed you will find that it has some trainer like tendencies. 1. Two of the 11 foam laser cut sheets were burned and cut all the way through. Lots of tape was needed to remedy the parts that had holes. Minus one star for poor quality control. 2. The kit did not take into account that the non-Flite test motors are reversed and then mounted, leaving the back end propeller shaft jabbing into the wheels. My own improvements helped remedy the problem, as opposed to damaging the motors and the wheels. Minus 1 star for the kit being prematurely released without the correct power pack being sold. If you can remove the keyed shaft at the “back” end of the motors, please disregard this comment. Other than that, the kit is worth nearly every dollar. If you want to purchase this kit and use full rudder controls and not the standard differential thrust, purchase some y-leads (one or two) for connecting the motors and the ailerons in parallel instead of programming each motor individually. Don’t be afraid to improvise on these foam craft. Happy flying. The A-10 was my second FT kit (did a Bloody Baron previously)and have done several others using free plans. The wing and fuse went together easily, though the nose and canopy require a bit of care to get everything to line up. As another review noted the Eflite motors supplied in PowerPack C don't work when you reverse them because the non-removable shaft extends through the firewall and touches the wheels, making them inoperable. I exchanged these for the Flite Test Radial motors (FT 2218B 1050Kv). For the maiden flight I used a 4S 3000 MAh but the FT2218B motors drew too much current and the 30A ESCs went into shutdown mode after about 30-60 seconds. Customer support suggested using a 3S battery since the motors were more powerful than those supplied with Powerpack C. I tried using a 3S 5000 MAh battery; there was less power and again the ESCs began to lag after 3-4 minutes. The motors were quite warm to the touch so I'm assuming that the ESCs were as well and that they sagged due to thermal protection kicking in. The A-10 flies great right up to the point where the sag begins. My all up weight came in at 59 oz, but that includes the 5000 MAh battery which weights 12 oz. I also painted mine with flat gray Rustoleum (took 1 can) so that added a bit of weight. I fly from a desert area (no grass, just hard pack sand) so I added a skid made of foamboard to the tail. Its covered with packing tape and keeps the vertical fins from dragging during landing. I plan to try to replace the 30A ESCs with something larger so that I can use a 4S battery. I am concerned that the ESCs are buried in the wing with little airflow and that even larger ESCs may be prone to over-heating. This was a challenging but very fun build. I had no problems with my motors, (bought the suggested power pack) used the included adapter and swapped the ends of the motor for the other style prop adapter. You do need to plan ahead. I wished I had devised a landing gear setup to connect into the nacelles before I built them but I have a few ideas. There are supplied reinforcements for the nose gear, and it is off-set just like on the actual plane. I had no issues with the quality of my kit. Only on the rudders did I notice a slight burn through where you dig out the foam, but they were only pin holes. Follow Josh's build video and you should have no problems. A few spots I had to watch the video several times to make sure what I was doing. Test fit your parts often BEFORE glueing. Only problem I had is the tail cone, it has many irregular shapes/facets and requires many bevel cuts. I found it easier to get it lined up flush with the tail of the plane, and then glue it together as I attached to the rear. Plan on doing mine up in some sort of camo design, have not chosen colors yet, but figure light gray for the bottom, possible light gray/brown/green for the top? Since I had a spare XR8 (frsky) receiver laying around, figured I may rig up flaperons even though it does not need flaps. If I could change anything, it would be to include or offer a landing gear kit. I may install a steerable nose gear in mine. Should also include a fake gun barrel. What is an A-10 without the gun. I got hold of some Eflite retracts and installed them. Looks much better and they retract forward. I went to 3 blade 9" props to get me a bit more ground clearance. Just wish I had built in the retracts before I built the plane. Hope to maiden this week end if the weather cooperates. 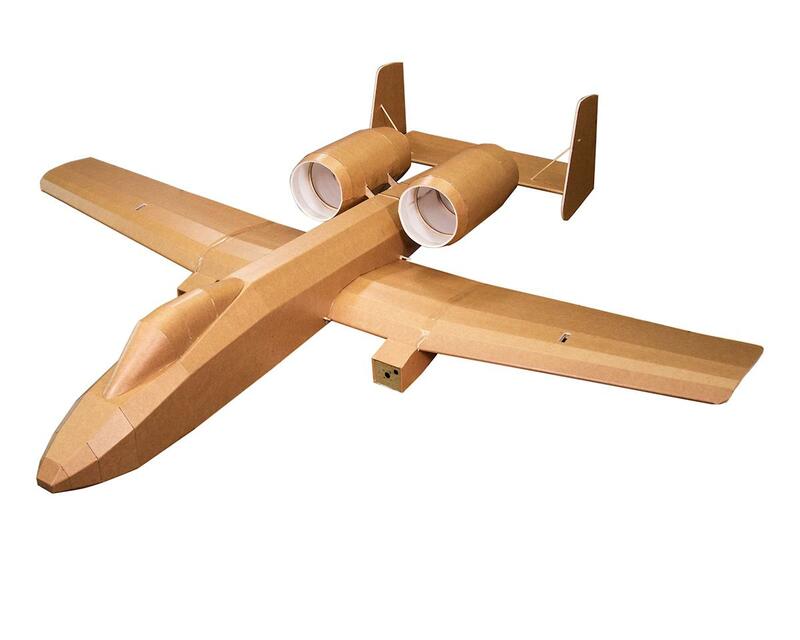 Check out the Flitetest Facebook page, several of us building this beast on there. Many pictures and ideas being shared. Although it lists as out of stock online, I ordered one the other day and it just got delivered. Packaged well. This kit turned into the biggest disappointment for me. I bought it and the Power Pack C with the plan to enjoy both building it and flying it. While the build video is fairly straight forward, you'll find that it lacks any details for the nose landing gear, and doesn't have any options for a 'wheels down' configuration for the rear gear. You'll have to figure that out yourself. Furthermore once you are done building you will find extra plywood pieces left over that aren't mentioned in the video at all. What are they for? Why are they included?? Unfortunately this is where the Power Pack C falls flat on it's face. The motor is only rated for 2-3S voltage. Running it on 4S pulls ~480 watts per motor when it is only rated for ~250 watt bursts!! The motors get hot quickly, even when using only 50% throttle. The build video shows them using Flite Test Radial motors. Reading the specs for them is incredibly frustrating! They vaguely state: "Incredible Thrust Output (Over 1Kg/motor on 4s and most prop choices)". How many amps is that? How many watts? What prop sizes are recommend? So many questions and so few answers. I've resorted to swapping to RC Timer 3530/10 motors with 40A ESC's purchased elsewhere. That required redesigning the nacelles to fit the bigger motors, which I didn't expect to have to do when I bought the full kit AND the recommended power pack! I have yet to remaiden, but I've now got over $250 spent on this plane. For that kind of money the Dynam A-10 or the Freewing 64mm A-10 can be bought and flown right away with none of the above hassle. Stay away until they update the power packs, add landing gear instructions, and turn this into a more 'polished' product. Overall I can only rate this kit as 2/5. One star for the physical design, and another for well cut parts. The kit was packed with the usual quality. Assembly was in the Flitetest style, expect more attention to detail. Following the video was essential. Josh was clear and precise, however my parts didn’t fit together, he just put them together, while I work at it. The finished A-10 is impressive and was a hit at the field. No one could believe it was foam board in its camo paint. It flew like it was on a rail with the 2200 mAh battery. In all it was a project that produced an awesome A-10. My second FT build. Overall the build went well. There was a lot of wrinkles on the nose section which was in the middle of the bundle. Not sure how the surrounding pieces were not wrinkled? Also, nothing in the build vid about the tricycle landing gear. I don't want to risk breaking props every time I land. I'm using the new ft radial motors with the ft 35A escs. They are really tiny, I hope they can handle the heat. I would have liked if the premium power packs were out already because I purchased mine separately. Anyways, I'm gonna be flying a 4s 5100 from rmrc that usually is in my stratosurfer. It balances out well so it should be a fun time. I want to buy this plane.